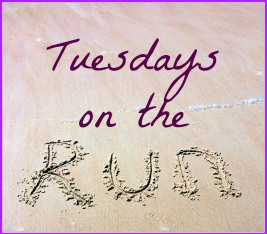 Today I’m joining Erika from MCM Mama Runs, Patty from My No-Guilt Life, and April from Run the Great Wide Somewhere for the Tuesdays on the Run Linkup. This week’s topic is Race Day Rituals. This is a great topic for this week since in three short days I’ll be on my way to Virginia Beach for Shamrock weekend. 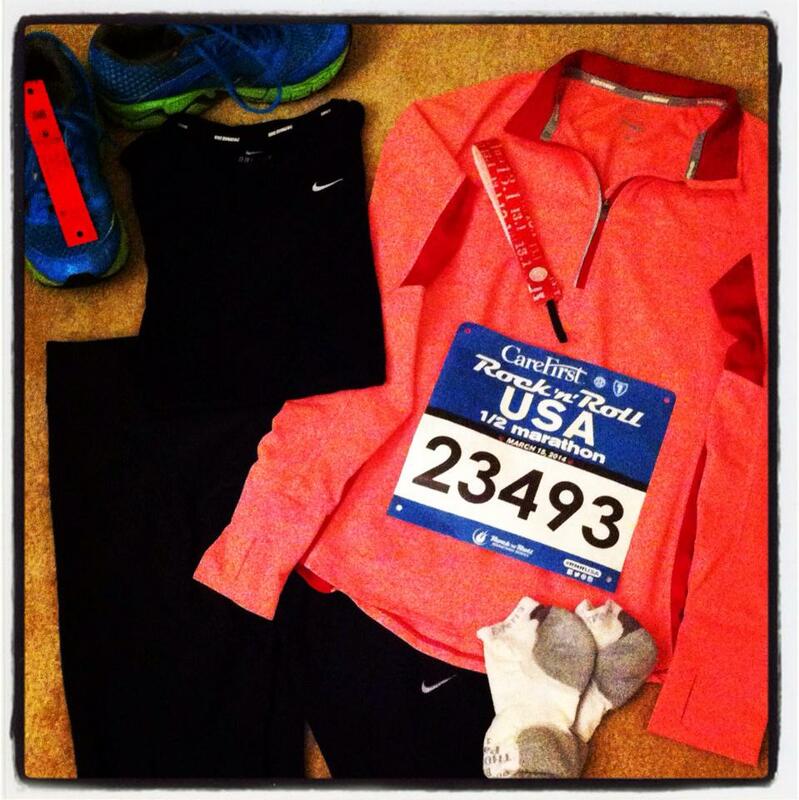 My race day rituals actually start the night before the race, when I lay out my race day outfit. I always love taking my “Flat Kathryn” photo. After getting my race bib, taking my flat race photo always makes race day seem like its really the next day. In addition to laying out my race outfit the night before, I also try to get everything else laid out that I’ll need on race day, including my Garmin, race fuel (usually a combination of Gu Energy Gels and Clif Shot Bloks, depending on the length of the race), my hydration belt (I usually wear my belt for any races 10k or longer in distance), my sunglasses, and Body Glide. If I’m going to check a gear bag, I make sure that its packed, which usually includes a change of clothes and sandals to put on my feet after the race. On race morning itself, I always take a shower. Showers help me to wake up, and I like having a clean face and body when I go to run a race. While this ritual might seem odd to some, I find a shower to be useful. After I’m dressed, I eat my usual race day breakfast: a peanut butter sandwich and a banana. When I travel for a race, I usually bring the food I need with me. You never want to try something new on race day, and you never know what a hotel or nearby restaurant might have available. Once I’m at the race, I always make sure to take lots of pictures before, during, and after the race. I usually bring my “running” camera with me. Its a small, cheap Canon camera that Preston and I had to buy from a Best Buy Express on our honeymoon after our old point and shoot camera broke only a couple of days into our trip. While it isn’t an advanced camera by any means, it takes better quality pictures than my phone does, and has a strap, so if I want to I’m able to keep it around my wrist while running a race. And since it wasn’t an expensive camera, I won’t be heartbroken if it accidentally gets dropped. 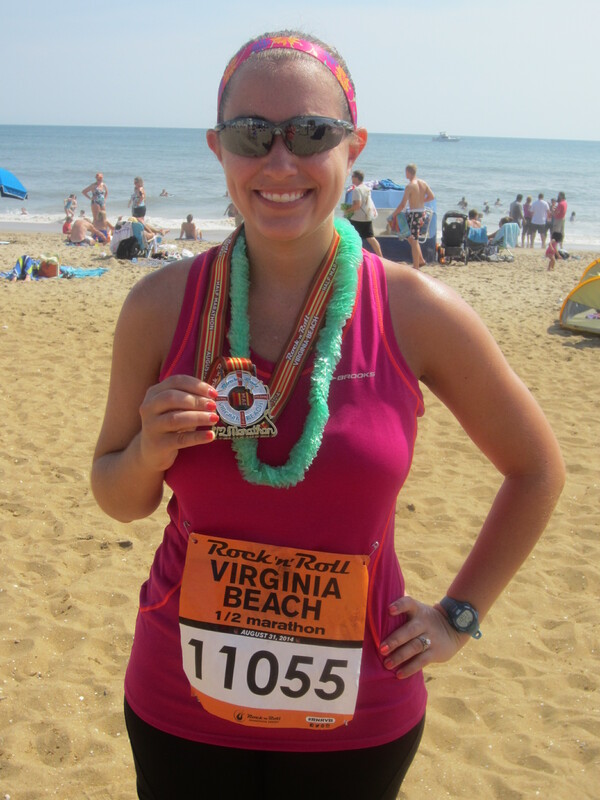 And if its a race that I’ve earned a medal at, my race day experience isn’t complete until I’ve taken a picture with my medal. Speaking of races, have you entered my Magical Miles giveaway yet? This book is a perfect resource for any runner thinking about running a race at Disney World. QOTD: What is one of your race day rituals? 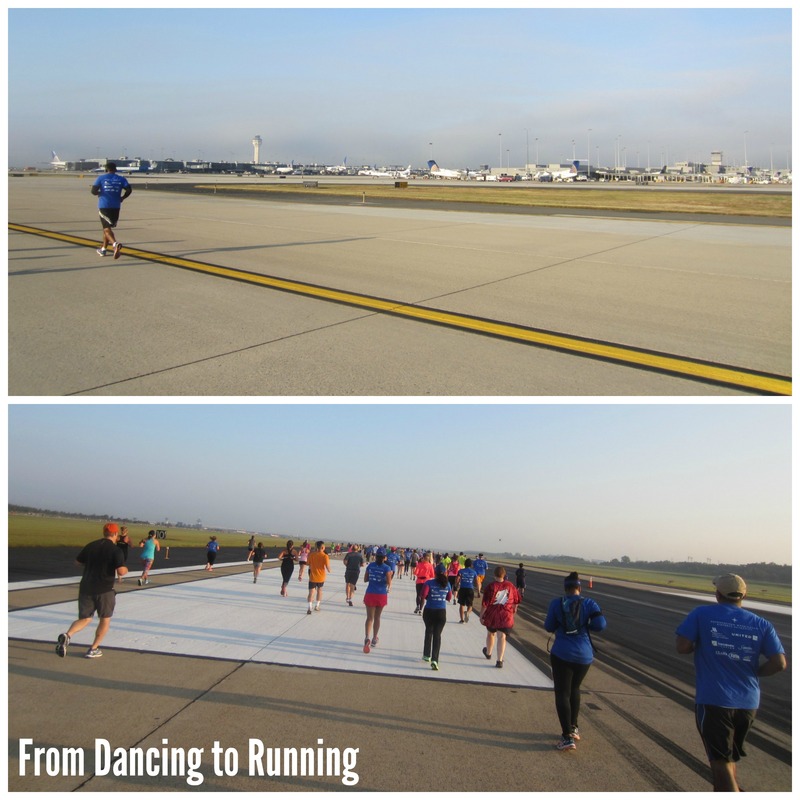 This entry was posted in Races and tagged rituals, Tuesdays on the Run. Bookmark the permalink. I don’t really have rituals and in fact sometimes don’t even lay my clothes out the night before LOL. I do shower most of the time before a race. I like being clean to start too. I’m glad that somebody else can appreciate what others think is a really weird habit. I have similar rituals, I need everything in order or I go a little nutty. I actually had anxiety dreams last night that I wasn’t prepared for my half marathon this weekend because I didn’t lay everything out ahead of time! Oh no! Hopefully your dream will make you want to double and triple check that everything is all set and ready to go! My race day prep is similar to yours! I try to leave nothing to chance! Because when you do, its likely that something will be forgotten. I ALWAYS take a “flat Road Runner Girl” picture the night before every race! 🙂 And pictures before, during, and after the race are a must! The more pictures, the better! I always need to lay out my flat runner. It just helps me feel calm for the morning knowing all my stuff is in one spot. I lay out my clothes to make sure I have everything and it matches the forecast. I also bring my breakfast with me since it’s tried and true. Better to stick with what your body knows that not knowing how your body will react to something new. A peanut butter sandwich is my go to race day breakfast too 🙂 It seems like a safe choice but provides enough fuel to keep my going for the morning. Oh no! Hopefully you were able to fix the camera and get the setting switched back! I always set 2 alarms and quadruple check that they’re set. I’m so nervous I won’t wake up! I’m often nervous about the same thing. I have coffee, water and pray. I always make sure to take care of restroom business first too TMI I know sorry…don’t want to have to use the portable. Thanks for sharing! I usually wind up using the porta potties multiple times. Must be the pre race nerves! I have to lay out all of clothes, review my race plan and try and get into bed 8 hour before I need to be up. I never seem to get enough sleep the night before a race. My rituals are similar minus the morning shower. I figure I am going to get sweaty so I save the shower for after. I too like taking a pic of my race gear laid out and of course a pic of me and the medal after the finish! A pic of me with the medal at the finish is a must! I definitely make a flat Marcia. The more I have done the night before, the better off I am. I’ve never tried PB on a waffle. I might have to try that sometime – but not for the first time on race morning. Great idea to have rituals. Makes it more special and fun for your looking back. I always have to lay out my clothes and gear (gu, Garmin, roadID, etc) the night before so I don’t have to worry about forgetting something. Sounds like you’ve got a great set of rituals! Thanks for linking up with us! I have everything laid out the night before as well. I take a pic of my race shirt, bib and medal in one shot. It’s a virtual scrapbook for me. What I do is almost the exact same things you do! I HAVE to have everything laid out or I can’t focus at all for sure 🙂 Eating the SAME thing is something I always do as well- can’t take any chances there. I do the same. I always lay out my clothes and gear the night before. I always eat the same exact thing before a race or long run too, an english muffin with almond butter! I really don’t think I have any race day rituals, other than “eat breakfast”. I don’t know how people can run long distances without eating first! We have a few very similar race day rituals.